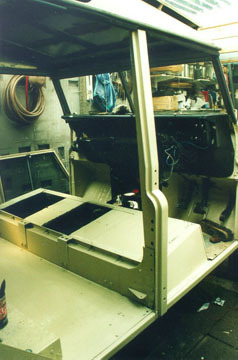 The rear tub was put back onto the chassis after renewing some of the under floor strips and extensive use of fibre-glass and resin as an anti-rust measure. 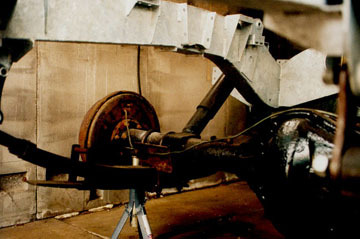 The side frames are attached to the chassis by a substantial angle bracket and the tub at the front attaches to the brackets on the outriggers. The petrol filler pipe was fitted next. 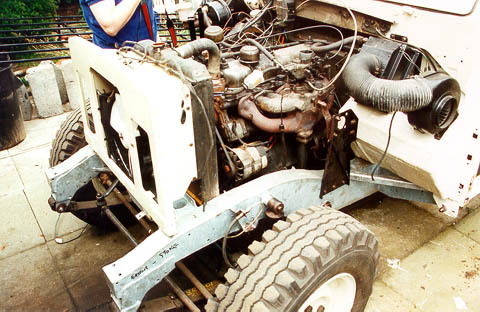 It had been removed and cleaned and painted up with chassis balck paint. 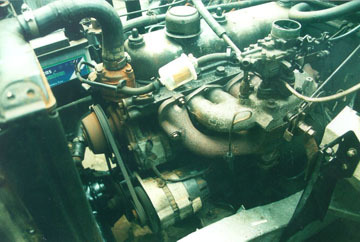 A new flexible pipe was used to the petrol tank pipe. The petrol tank had been painted black too while it was off. 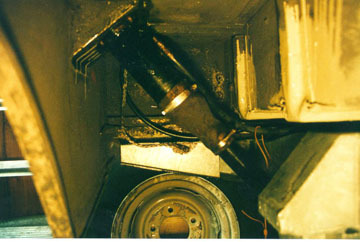 The cable coming through the chassis was fed up through the tub into the area behind the lights. Another length of seven core cable was then fed from here back through the tub to go along the rear crossmember and up through the tub on the other side for those lights. This kept all the terminations inside the vehicle and not subject to the wet and mud under the wheel arches. The length of orange twine used to pull the cable through the chassis was left in place in case I ever need to pull something else throught the chassis. The rear springs and back axle went on next together with new shock absorbers/dampers. To compress the springs while tightening the shackle bolts I used a chain around the chassis and a trolley jack sitting on an old cylinder head. without all the body and roof on there would not have been enough weight to bring the springs up to the correct position. 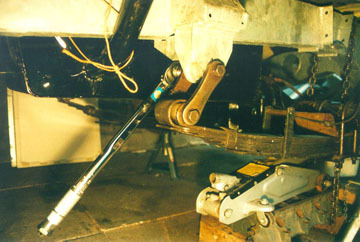 The main problem with fitting these springs as opposed to the front ones was the weight, both of the rear Salisbury axle and the springs themselves. 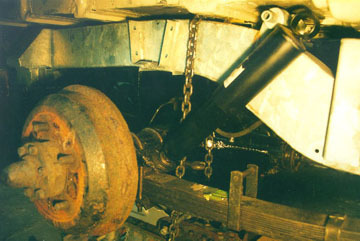 It was quite a mauling job trying to position the axle on the springs and then get the shackle bolts into position. fortunately I had a couple of trolley jacks and three sets of axle stands to assist. I had to fit the rear prop shaft to hold the diff up so the axle was at the right angle on the springs before I could fit the u-bolts. These were new and well greased before fitting them and the bottom plates had been cleand up and painted too. Because of the lack of space it meant a lot of crawling about on the floor. 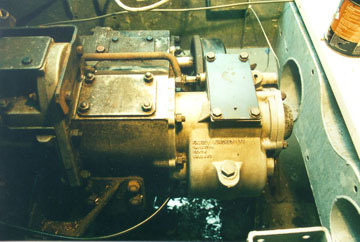 The overdrive was fitted to the rear of the gearbox at some point during this time. Now things really began to come back together. 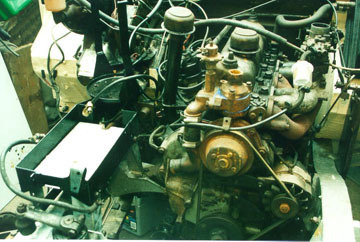 The radiator and hoses were fitted, the battery put into position and the throttle linkages connected. 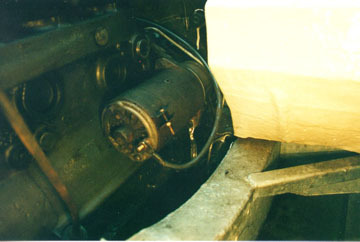 The starter motor was refitted and the ignition coil with the transistor assisted ignition were wired and fitted into place. 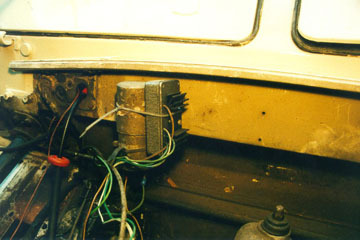 The transistor assisted ignition was built from a Maplin electronics kit and basically meant that the points in the distributer switched the transistor which pulsed the coil so producing a higher voltage spark and preventing arcing on the points so they lasted longer and hence needed less adjustment, seems to work well. 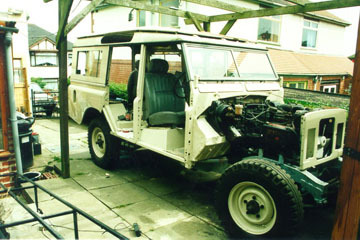 Now all the wheels were on and the Landy was really looking the part again. The heater matrix box and blower fan were in position now on the bulkhead. 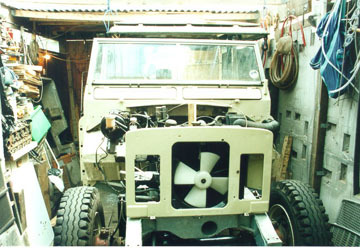 The radiator fan was fitted to the front of the radiator, this helps the engine to warm up in cold weather, it only gets switched on when the temperature guage goes up too far. The windscreen frame was cleaned and painted. 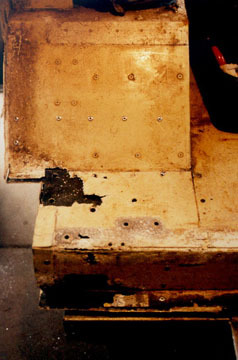 The foam rubber cushening/seal goes between the bulkhead and bottom of the frame then the nuts on the inside tightened to bring the angle to the correct position before the bolts on the outside are tightened up. the side window frames were fitted and then the roof lowered into position. 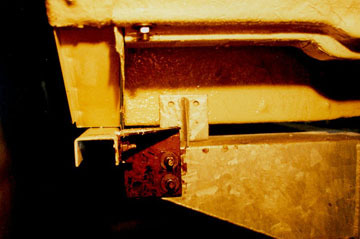 There seems to be an endless number of nuts and bolts securing the roof in place. All around the side window frames and across the top of the windscreen as well as those at the top of the door pillars. 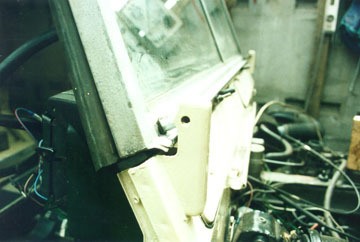 There was various pieces of rubber seal at the top of the side window panels and the windscreen angle had to be readjusted several times to get the bolts in properly. 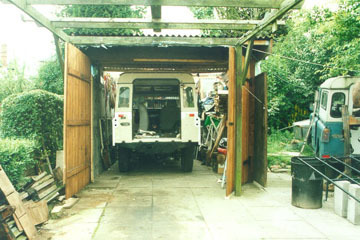 The garage doors were opened and for the first time in a couple of months and the Land Rover saw the light of day, a grey day but light nontheless. So now the front wings had to go on and the doors. With the wings on the front lights could be wired up and the wiring throughly tested. 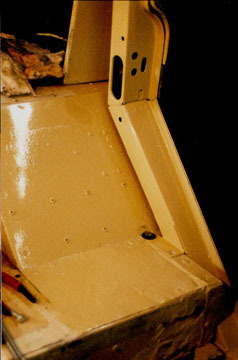 The seats which were from an old Rover SDI were installed on the freshly painted seat box. All done and ready to go. The MOT was nearly due and I drove it out with some trepidation hoping that I hadn't forgotten anything major. 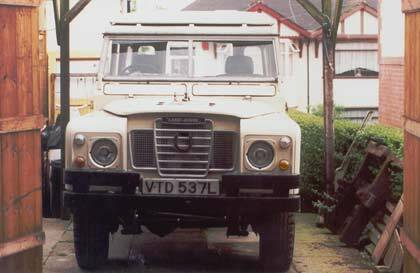 The man at the garage I go to for the MOT was delighted to see a Land Rover with a good chassis under it and an absence of mud and rust. It passed so I was well pleased.